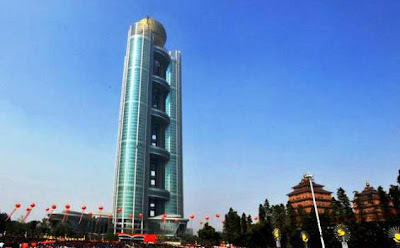 This Longxi Hotels was located on the richest village in China Huaxi, this longxi hotels was famous for its luxurious building, Where it uses gold for their floor, it's more higher than the Eiffel tower on Paris. Hotel Longxi in Huaxi village has been built to celebrate the 50th anniversary of the village. The village, located in east China's Jiangsu province, has become the first rural area in the world that has its own skyscrapers. As quoted by China Daily, the building was named Longxi International Hotel and located in Huaxi, which is still classified as a village of Jiangsu province, eastern China. The building has a height of 328 feet which will cost $470 Million for its construction. This 74 floor hotel has been built for 4 years and now ranks as the tallest skyscraper no. 15 in the world, and taller than the Eiffel Tower in Paris ( 324m ) also in New York's Chrysler Building ( 319m ). 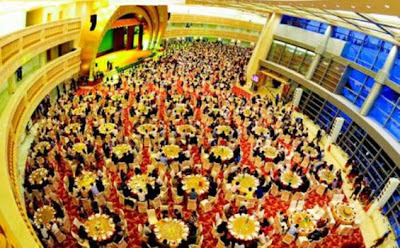 Zhou li Huaxi Communist Party deputy, said a shareholder of Longxi International Hotel is a village of 200 households, each providing 10 million yuan or about $ 1.5 million for the project model. "The building is a symbol of collectivity. The hotel is expected to accommodate businessmen, officials, or tourists who want to conduct their activities here, " said Zhou Li. Inside the building there is a restaurant, a swimming pool on the roof, malls, movie theaters, spas, and the floor is made of 60 tons of gold. Huaxi Group, which manages corporate business Villagers have 2,000 shareholders. Everything that is registered to a resident. The hotel offers 800 suites that can accommodate 2,000 people. A statue of a bull, made ​​of solid gold is reported to have a ton of weight, have also been installed. 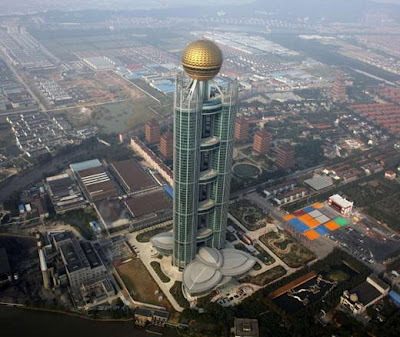 Golden Cow is a testament to the wealth of this village, will greet visitors at the 60th floor of the Huaxi Hotel tower.